Mitre Peak is an iconic mountain in the South Island of New Zealand. It is one of the most photographed peaks in the country. 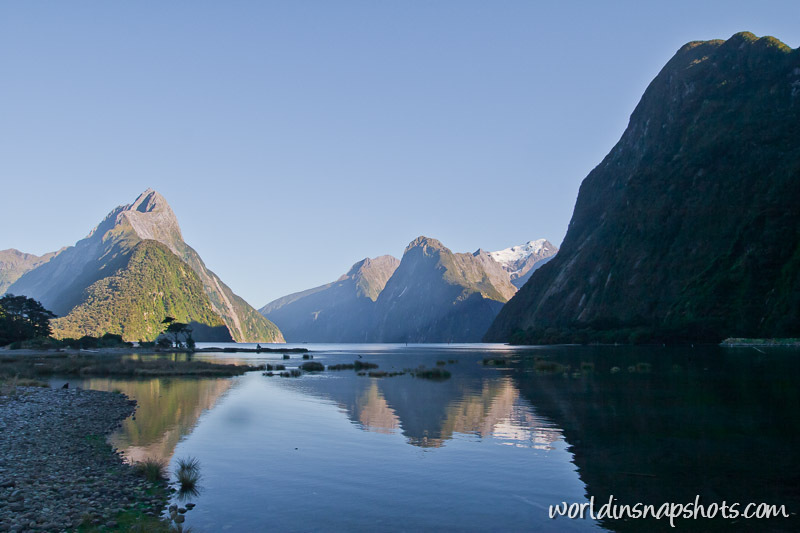 It is a prominent peak on the south shore of Milford Sound. At a height of 1692 meters (5560 feet), this is one of the highest mountains in the world that rise directly from the ocean floor. So named because its shape resembles that of a Bishop’s mitre, or head-dress. Lion Mountain is situated across to the right rising to a height of 1302 meters (4272 feet). The mountain’s correct names i Mt. Kimberly, but because its shape so strongly resembles that of a crouching lion, this more descriptive name has been retained.